Jake Turx, a Jewish reporter for Ami Magazine, asked President Donald Trump a question on Feb. 16. 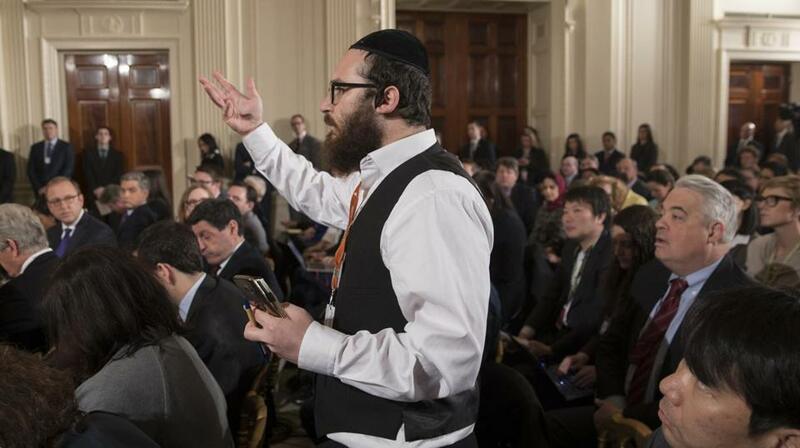 Jake Turx is a newly minted White House correspondent for a publication that has never before had a seat in the White House press corps: Ami Magazine, an Orthodox Jewish weekly based in Brooklyn, New York. He is a singular presence in the briefing room: a young Hasidic Jew with side curls tucked behind his ears and a skullcap embroidered with his Twitter handle. When President Donald Trump called on him at a news conference Thursday, saying he was looking for a “friendly reporter,” Turx was prepared. He had spent an hour crafting a question about a recent surge of anti-Semitism, with a preamble that he hoped would convey his supportive disposition toward Trump. Turx tried to interject, realizing how the encounter had turned. He said he had wanted to clarify that he in no way meant to accuse Trump of anti-Semitism but instead intended to ask what his administration could do to stop the anti-Semitic incidents. But Trump would not let him speak again, saying, “Quiet, quiet, quiet.” As Turx shook his head with an incredulous look on his face, Trump accused him of having lied that his question would be straight and simple. He went on to say that Prime Minister Benjamin Netanyahu of Israel, during his visit to the United States on Wednesday, had vouched for Trump as a good friend of Israel and the Jewish people and no anti-Semite. “Just shows you about the press, but that’s the way the press is,” Trump said. At the news conference, Turx was referring to a rash of incidents that have shaken many American Jews since Trump was elected. On three separate days in January, Jewish synagogues, community centers and schools across the country received what seemed to be a coordinated wave of telephone bomb threats that led to evacuations and FBI investigations. Other Jewish institutions have seen an uptick in vandalism and graffiti in the last few months. It was the second time in two days that Trump was asked to denounce anti-Semitism and offer American Jews a dose of reassurance. In his joint news conference with Netanyahu, Trump responded to a question about anti-Semitism by breezily recounting the size of his Electoral College victory and then reminding the reporters that his daughter, Ivanka, his son-in-law, Jared Kushner, and their three children — Trump’s grandchildren — are all Jewish. Surveys show that Trump was not the choice of the majority of American Jews, who tend to vote for Democrats and came out in force for Hillary Clinton. Many Jews have been critical of Trump for not more forcefully denouncing anti-Semites and racists like David Duke, a former leader of the Ku Klux Klan who endorsed Trump during the campaign. Many Jewish leaders are also wary of Stephen Bannon, Trump’s White House strategist, because of the close affinity between Breitbart News, which he once ran, and the white supremacists in the movement known as the alt-right. But Trump was popular among many Orthodox Jews. They were reassured to see the Orthodox Jews in his family and attracted to his hawkish line on Israel, his support of vouchers for religious schools and his promise to ban Muslim immigrants from entering the country. Rechy Frankfurter and her husband, Yitzchok Frankfurter, founded Ami Magazine more than six years ago to serve a conservative Jewish audience. It circulates in the United States, Canada, Europe and Australia and is one of several English-language news publications serving the ultra-Orthodox community. Ami Magazine comes out weekly and has three sister publications: one for women, one for teens and a cooking magazine called Whisk. The magazine interviewed Trump before he declared he was running for president and did so again during the campaign. “We didn’t do a political endorsement of him, but I really wanted the president to be elected, and I do want him to succeed,” said Yitzchok Frankfurter, the editor-in-chief. Rechy Frankfurter, the magazine’s senior editor, said it was clear that Trump was not an anti-Semite and that Trump “must have misheard the question” from the magazine’s reporter. “The president is very sensitive to such an accusation, and we find the fact that he’s sensitive to it reassuring,” she said, because it means he understands how awful it is to be thought of as an anti-Semite. After the news conference, Turx, a pen name, said that he had had conversations Thursday evening with White House staff members and that he and members of the Orthodox Jewish community were “extremely confident” that the White House would give “the proper help, guidance and collaboration” on anti-Semitism.